Edge is the new browser for Windows 10 from Microsoft. The new browser from Microsoft is no competitor to Google Chrome or Mozilla Firefox just yet. The browser although is the default web browser in Windows 10, its market share is under 32% on Windows 10 according to Net Applications, which indicates that most PC users prefer third-party web browsers over Microsoft Edge. Microsoft has been updating the Edge browser to include new features and options. The Edge browser should be comparable to Chrome and Firefox by the end of this year once it gets extensions support. For those users who are not impressed with the new browser’s capabilities, Windows 10 doesn’t offer a way to uninstall or block the browser. And since it’s an app and not a classic desktop program, we can’t block or uninstall it using standard application blockers out there for Windows. Few months ago, we reviewed a third-party tool which let you uninstall and remove Edge from Windows 10. In this article, we are sharing another third-party tool designed to completely block Microsoft Edge on Windows 10. 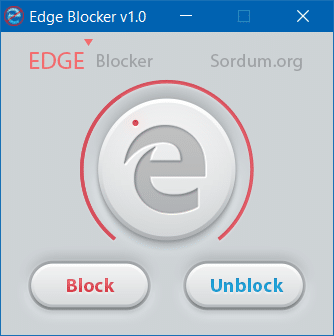 Edge Blocker is another free software from Sordum website. As you likely know, the Sordum website has tens of free tools like Easy Context Menu to add new options to context menu, DNS jumper to quickly change your DNS, Firewall App Blocker, and Qemu Simple Boot using which you can easily test if your bootable USB or ISO is really bootable. The Edge Blocker software does one job and does it pretty well. It’s designed to completely block Microsoft Edge browser on Windows 10 with a click, and the software does its job without a fuss. The program comes in handy, especially if you’re on Windows 10 Home or Windows 10 Pro edition as these editions of Windows 10 don’t include the Applocker feature to block apps without the help of third-party tools. Step 1: The first step is to download the latest version of Edge Blocker on your Windows 10 PC. Visit this page to download the latest version. Step 2: Extract the downloaded zip file to get Edge Blocker executable. Right-click on the Edge Blocker executable and then click Run as administrator. Yes, you must run the Edge Blocker with admin rights in order to block or unblock Microsoft Edge on your PC. NOTE: If you see the following screen while trying to run Edge Blocker, please click More info and then click Run anyway button. The Edge Blocker is a safe program. Step 3: Finally, click the block button to block the Edge or click unblock Edge if it’s already blocked. 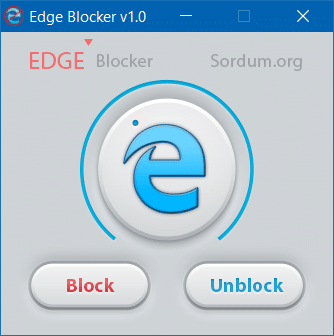 Last but not the least, Edge Blocker is a free software and it’s portable as well. You don’t need to install it. Simply download, extract, and run. Thanks to Hikmet Guner for asking us to review this handy software on Into Windows. I was answered by an Oriental that could barely speak English. He said he was under contract by “Windows”. I still do no have access to MS Edge. I hate when articles are full of links but that none leads to the target of the told article. I really dislike how internet becomes. Why do you want to block Edge browser when you can make Internet Explorer default or install any other browser and make the new browser default.